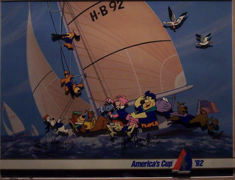 Hanna-Barbera Limited Edition of the 1992 "America's Cup." #73/400. Overall Size 16 x 20 Inches. 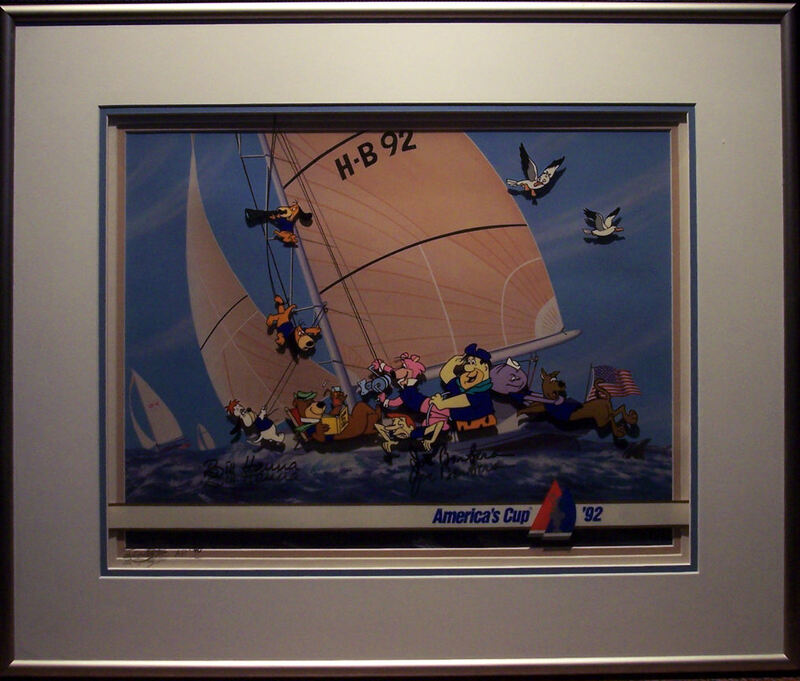 AMERICA’S CUP 1992 Hanna Barbera Hand Painted Limited Edition Cel of America’s Cup. Presented on a studio prepared photographic background. Signed by Bill Hanna and Joe Barbera #AP 3/40. This piece is Framed and matted in a 3-D presentation. The cel is suspended above the background and creates the depth seen when framed. ﻿﻿CIRCUS OF THE STARS 1992 Hanna Barbera Hand Painted Limited Edition Cel of Circus of the Stars. Presented on a hand painted presentation background. Signed by Bill Hanna and Joe Barbera #AP 3/40. This piece is packed as new, and has only been opened for inspection. BABU 1977 Studio Print (Xerox) Model Sheet of Babu, the Genie. 6 Images. BOO-BOO BEAR 1977 Studio Print (Xerox) Model Sheet of Boo-Boo. 14 Images. BRIDE OF FRANKENSTEIN 1980 Production Cel of the Bride of Frankenstein. From "The 13 Lives of Scooby-Doo . CAPTAIN CAVEMAN 1980 Directorial Animation Layout Drawing of Captain Caveman and the Teen Angels From the Flintstone’s Comedy Show. CAPTAIN CAVEMAN 1980 Directorial Animation Layout Drawing of Captain Caveman from the Flintstone’s Comedy Show. CAPTAIN CAVEMAN 1980 Directorial Animation Layout Drawing of Captain Caveman, Brenda and Taffy From the Flintstone’s Comedy Show. CAPTAIN CAVEMAN 1980 Directorial Animation Layout Drawing of Dee-Dee Talking to a Rather Confused Gentleman. 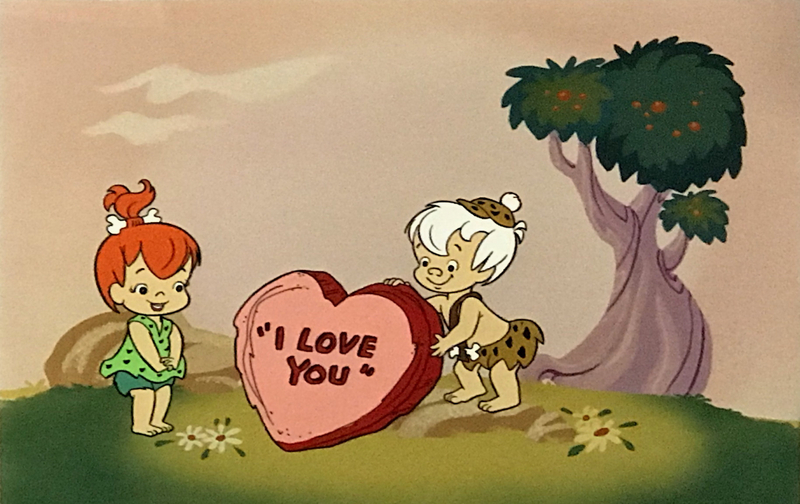 From the Flintstone’s Comedy Show. CAPTAIN CAVEMAN 1980 Directorial Animation Layout Drawing of Taffy From the Flintstone’s Comedy Show. CAPTAIN CAVEMAN AND BRENDA 1977 Studio Print (Xerox) Model Sheet of Captain Caveman and Brenda. 4 Images. CINDY BEAR 1977 Studio Print (Xerox) Model Sheet of Cindy Bear. 7 Images. CINDY BEAR AND HUCKLEBERRY HOUND 1977 Studio Print (Xerox) Model Sheet of Cindy Bear and Huckleberry Hound. 5 Images. FENDER BENDER 1980 Animation drawing of Hong Kong Phooey in his car from the start of the race. Signed by Bill Hanna, Joe Barbera and Iwao Talamoto. Mat is dedicated “Best Wishes, Iwao Takamoto”. MATS DIRTY AND IN NEED OF CLEANING. FRAME INCOMPLETE - NEEDS WIRING AND SPRINGS. PEBBLES AND BAMM-BAMM, I LOVE YOU 1989 Pebbles and Bamm-Bamm hand-painted publicity cel presented on a Hanna-Barbera print background created for this piece. Hanna-Barbera Limited Edition of "Bronto-To-Go." #164/300. 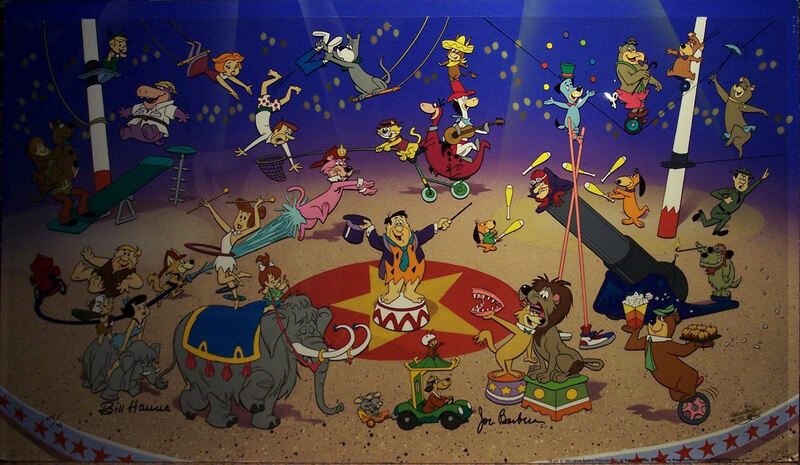 Signed by William Hanna & Joe Barbera. Overall Size 9 x 12 Inches. THE FLINTSTONE’S COMEDY HOUR 1980 Animation Drawing of Fred Carrying the Lawnmower While Being Choked by Its (the Lawn Mower’s) Mother’s Tail. THE FLINTSTONE’S COMEDY HOUR 1980 Animation Drawing of Fred Carrying the Lawnmower. THE FLINTSTONE’S COMEDY HOUR 1980 Animation Drawing of Fred’s Lawnmower in the Hands of Mr. Frankenstone. THE FLINTSTONE’S COMEDY HOUR 1980 Animation Drawing of the Frankenstone’s Family Pet Eating a Bone. THE FLINTSTONES 1970’s Production Cel of Fred Dancing with the Five-Armed “Gleep.” Note the Look of Fear in Fred’s Eyes. Presented on a Watercolor Production Background. 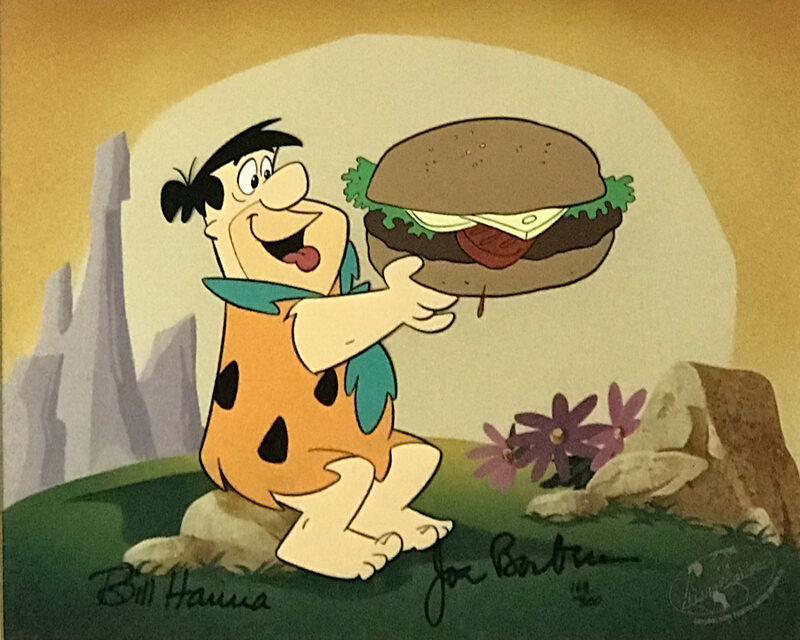 THE FLINTSTONES 1980’s Production cel of Fred Flintstone. THE FLINTSTONES 1976 Studio Print (Xerox) Model Sheet of Dino. 3 Images. THE FLINTSTONES 1976 Studio Print (Xerox) Model Sheet of Fred and Dino. 4 Images. THE FLINTSTONES 1976 Studio Print (Xerox) Model Sheet of Fred, Wilma and Dino. THE FLINTSTONES 1976 Studio Print (Xerox) Model Sheet of Fred. 4 Images. THE FLINTSTONES 1976 Studio Print (Xerox) Model Sheet of Mr. Creepley. aka Gruesome. THE FLINTSTONES 1976 Studio Print (Xerox) Model Sheet of Mrs. Creepley. aka Gruesome. THE FLINTSTONES 1976 Studio Print (Xerox) Model Sheet of Wilma. 3 Images. THE FLINTSTONES 1976 Studio Print (Xerox) Model Sheet of Wilma. 4 Images. THE FLINTSTONES 1970’S Three-Cel Setup of Barney, Wilma and a Third Character. THE FLINTSTONES 1970’s Two Production Cel Setup of Fred & Barney. Cels Have Very Early HB Embossed Seals. Production cel of Granny Dynamite from the “Big Bank Robbery” episode of the Flintstones.